Paleo vs. Keto Diets: Which Is Best for Me? 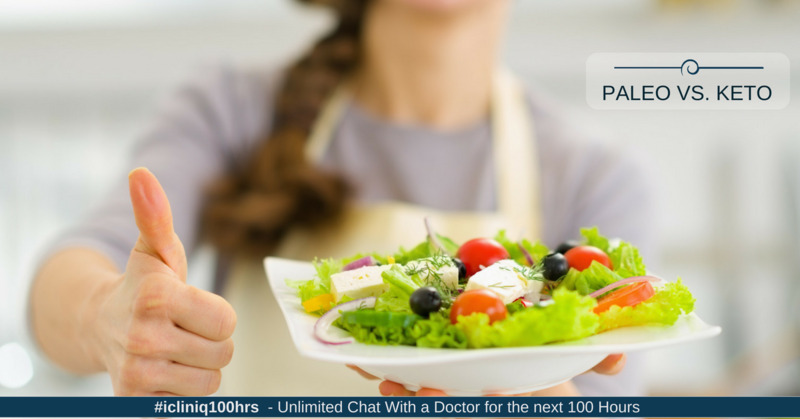 iCliniq › Ask a doctor online › Health Articles › Diet And Lifestyle › Paleo vs. Keto Diets: Which Is Best for Me? If you are someone who is health-conscious, you must be aware how popular paleo and keto diets are. Although they are confusingly similar, they are not the same. Let us first go through a brief introduction to the ideologies of each of these diets before getting into the details. Paleo diet is short for paleolithic diet which denotes eating 'natural' food in tune with what our stone-age hunter-gatherer caveman ancestors would have eaten. Since modern age diseases stem from us eating too much processed, man-made food with too much salt and preservatives, these are the very things that are to be avoided on a paleo diet. Keto diet is short for ketogenic diet. It was a diet initially created to prevent seizures in those with epilepsy. There were reduced incidences of seizures when patients with epilepsy went on fasting periods. This prompted more research into why that happened. And the answer was found to be the body going into a state of ketosis (the result of burning fat for fuel) when there was reduced availability of carbohydrates. So, here the focus is on eating a low-carb high-fat diet which teaches the body to burn fat instead of glucose. It is now used more as a weight loss tool. Why am I having uneasiness in breathing? It is a diet where you exclude food items that are difficult to digest by the body. It involves removing cereals, legumes, grains, beans, soy, dairy, refined oil, refined sugar, excessive salt and processed foods from the diet. Foods you can eat include fruits, vegetables, egg, meat, seafood, tubers, fats, nuts, roots, shoots, and seeds. This diet is said to comfort those with gut issues, inflammation, autoimmune diseases and weight issues. The typical keto diet advocates strictly watching the ratios of macronutrients (carbohydrates, proteins, and fats) in every meal. The recommended ratio is 70-80 % of fats, 20-25 % of protein and 5-10 % of carbohydrates. Some high-carb foods that are allowed in a paleo diet but a strict no in keto diet are starchy vegetables (sweet potatoes, pumpkin, carrots, yams, squash), high-carb fruits (banana, pineapple, grapes), natural sweeteners (honey, maple syrup) and dried fruits (raisins, dates). But unlike paleo, keto is not hard on dairy. In fact, it is seen as a good way to get the fats in. In this diet, you do not need to keep track of the percentage of fats, proteins, and carbohydrates you consume. The downside of this is you may overindulge on fruits and other naturally carb-rich sources. It is less of a diet and more of a lifestyle change as you eliminate certain unhealthy food types. It is not the best solution for weight loss unless you restrict the amount of carbs that go in. Weight loss, if any, is more gradual. The focus is more on consuming nutrient-rich food and elimination of processed foods. It is a very restrictive diet. In fact, it is difficult to include it into an already busy schedule. It provides the most dramatic results if weight loss is the desired target. You can check if you are on track by measuring the ketone levels at regular intervals. If you relied heavily on carbs before, this diet will be a drastic change in terms that you will now have to restrict the carbs to just 5 % of your diet. Since this diet is low on carbs, the body starts using up the stored fats for energy and this increases the ketone levels in the body. This state is known as ketosis. Ketosis benefits the body by lowering blood pressure, promoting weight loss, normalizing blood sugar, improving epilepsy, correcting cholesterol levels, and increasing mental clarity. Since paleo diet does not restrict carbohydrate intake, the emphasis is not on keeping track of ratios. So, there have been instances of people indulging in high-carb paleo-desserts which beats the purpose of a diet. Carbs are not essentially bad, but too much of it can derange your metabolism. Hence, even with paleo, there is a need to restrict the amount of carbs if you really want to achieve maximum benefits. Thus, a combination of keto (tracking macronutrients and keeping carbs to a minimum) and paleo (eating nutrient-dense natural, healthy foods) would be an ideal balance and key to good health. Do you have a question on Diet & Lifestyle or Paleo Diet? Kindly comment on my paleo diet reports. Is there any medication or laxatives to cure constipation?